Ferguson about the government's new taxes and broken promises. An unusually subdued Mr Hockey faced the ABC's Sarah Ferguson on 7.30 just moments after his budget speech. 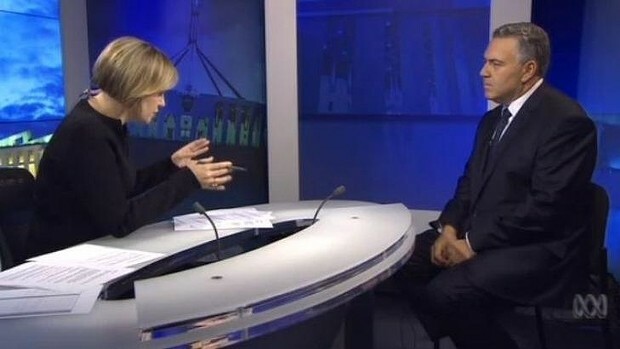 Joe Hockey faces Sarah Ferguson on Budget night. As he sat still in the opposite chair, hands clasped between his legs, Mr Hockey said he would not ‘‘accept the question’’. controversial measures like the new Medicare co-payment. ‘‘What we’re doing is good policy,’’ he said. Ferguson: ‘‘Is that what we’re going to call them now?" Ms Ferguson grilled him on the government's decison to cut $80 billion from schools and hospitals over ten years. "Are you starving the states so they beg you, effectively, to raise the GST?" she asked. "That's up to them, they are responsible for schools and hospitals." fell short of his typically confident appearances in question time. On Wednesday, Mr Hockey hit the airwaves, appearing on ABC's Radio National and AM, Sky News and commercial radio. Poll: What is your view of Prime Minister Tony Abbott's first budget? Poll closes in 8 hours. These polls are not scientific and reflect the opinion only of visitors who have chosen to participate.